We do not wish to be a people who suffer from the lack of historical knowledge and therefore a kind of social amnesia. We do not wish to be a people who anyone may tell stories of the past and be wrong. We are living in a historic time. Just imagine if more had been done to collect the histories of the bootleggers, moonshiners and prohibition activists at the end of alcohol prohibition. Instead, by the time organizations began to collect the first hand accounts of those involved alcohol prohibition most who had been involved had passed away and their first hand accounts, stories and personal records gone with them. The recorded history of marijuana prohibition should not just be police, criminal and legislative records, there are many great histories of people on the front lines that should be recorded and preserved while they are still with us and their memories are fresh. 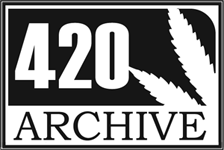 The idea of a 420 archive was conceived by several museum and educational professionals who were concerned by both the rapid changes underway with the legalization of Marijuana in the states of Colorado and Washington and by recent deaths and illnesses of long-time marijuana activists. A quick needs assessment revealed no institution – educational or museum was currently undertaking any oral history project targeting the marijuana growers and prohibition activists. In addition to that, the few historic documents dealing with marijuana prohibition and activism are fragmentary and scattered. We are looking into partnerships with other organizations to share knowledge and resources to help develop long term, safe and secure storage.